This article is about the Chinese province. For the style of cooking, see Szechuan cuisine. Sichuan (Chinese: 四川; pinyin: Sìchuān; Wade-Giles: Szŭ4-ch'uan1; Postal map spelling: Szechwan and Szechuan) is a province in western China. It borders quite a few different provinces and territories within the country, including Shaanxi to the northeast, Gansu to the north, Qinghai to the northwest, Tibet to the west, Yunnan to the south, Guizhou to the southeast, and Chongqing municipality to the east. Its provincial capital is located at Chengdu. The name Sichuan literally means "four rivers," and it stems from the fact that numerous rivers run through the province's many valleys and gorges. 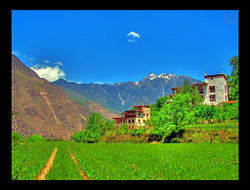 Sichuan, the home of ancient civilizations and ethnic groups, sits on the lifeline of ancient China, the Yangtze River. Known, even in ancient times, as a land of abundance, Sichuan continues to serve as an agricultural center for China. The province's abundance in natural resources, including mineral deposits and hydroelectric power, have transformed the region into a combination of heavy industry and knowledge-based hi-tech industries. Sichuan's challenge, the challenge facing all of China, lay in developing abundant natural resources for a needy population without devastating the ecology of the region. That is best epitomized by the Three Gorges Dam Project. The general territory of the province and its neighboring areas were the cradle of many unique local civilizations which can be dated back to at least the fifteenth century B.C.E. (i.e., the later years of Shang Dynasty). Beginning from the ninth century B.C.E., Shu (today Chengdu) and Ba (today Chongqing City) emerged as major cultural and administrative centers where two rival kingdoms were established. Shu's existence was unknown until an archaeological discovery in 1986 at a small village named Sanxingdui (三星堆 Sān Xīng Duī) in Guanghan County. This village is believed to be an ancient city of the Shu Kingdom, where excavations have yielded invaluable archaeological information. Although the subsequent Qin Dynasty destroyed much of the civilizations of Shu and Ba, their cultures have been preserved and inherited by the people in Sichuan to this day. The Qin government accelerated the technological and agricultural advancements of Sichuan, making it comparable to that of the Huang He (Yellow River) Valley. The Dujiangyan Irrigation System, built in the third century B.C.E. under the inspection of Li Bing, was the foremost symbol of modernization during that period. Composed of a series of dams, it redirected the flow of the Minjiang River, a major tributary of the Yangtze River, to fields, relieving the damage done by seasonal floods. The construction of this system along with various other projects greatly increased the harvest potential of the area, allowing it to become the main source of provision and men for Qin's unification of China. In addition to its agriculture, various ores were abundant in Sichuan, and adding to its significance, the area was also on the trade route from Huang He Valley to foreign countries in the southwest, especially India. Sichuan's military importance matches its commercial and agricultural value. Since the area within the province is actually a basin and is surrounded by the Himalayas to the west, the Qinling Range to the north, and the mountainous areas of Yunnan to the south, its climate is often heavily foggy. Since the Yangtze flows through the basin and is upstream to areas of eastern China, navies could be easily sailed downstream. Therefore, the area was home to the bases of numerous ambitious soldiers and refuges of Chinese governments throughout history. A few independent regimes were founded, with the most famous being Shu Han of the Three Kingdoms. The Jin Dynasty first conquered Shu Han on its path of unification. During the Tang Dynasty, Sichuan also served as a battlefront against Tibet. The Southern Song Dynasty established a coordinated defense against the Mongolian Yuan Dynasty in both Sichuan and Xiangyang. This line of defense was finally broken after the first use of firearms in history during the six-year siege of Xiangyang, which ended in 1273. Sichuan's infamous foggy climate also played a role in hindering the accuracy of the Japanese bombing of the basin and of Chongqing city, where the capital of the Republic of China had been moved to during World War II. Sichuan's borders have remained relatively constant for the past 500 years. This changed in 1997, when the city of Chongqing as well as the surrounding towns of Fuling and Wanxian were formed into the new Chongqing Municipality. The new municipality was formed to spearhead China's effort to develop its western regions as well as to coordinate the resettlement of refugees from the Three Gorges Dam project. Jianmenguan, Jiange, Sichuan, China. Reconstructed historical site of ancient fortress dates back to over 2000 years in Three Kingdom era. 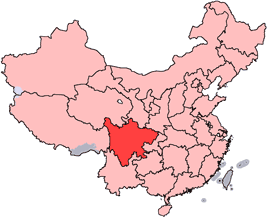 The eighteen prefecture-level divisions of Sichuan are subdivided into 181 county-level divisions (43 districts, 14 county-level cities, 120 counties, and 4 autonomous counties). These county-level divisions are in turn divided into 4782 township-level divisions (1865 towns, 2586 townships, 93 ethnic townships, and 238 subdistricts). The entire province lies in the Sichuan basin and is surrounded on all sides by mountains, with the Himalayas (喜玛拉雅山脉） to the west, the Qinling (秦岭) range to the north, and the mountainous areas of Yunnan to the south. The Sichuan Basin itself covers an area of 165,000 square km, making it one of the four largest basins in China. The Yangtze River flows through the Sichuan basin and lies upstream to areas of eastern China. The Minjiang River in central Sichuan is a tributary of the upper Yangtze River, which joins the main river at Yibin. The climate in Sichuan is often heavily foggy. Several cities are quite polluted and seldom receive sunny days. Sichuan is also important as one of the major industrial bases of China. In addition to heavy industries such as coal, energy, iron and steel, the province has established a light manufacturing sector comprising building materials, wood processing, food and silk processing. 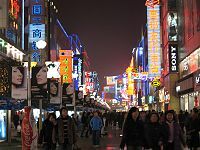 Chengdu and Mianyang are the two major production bases for textiles and electronics products. Deyang, Panzhihua, and Yibin are the production bases for machinery, metallurgy industries, and wine respectively. The wine production of Sichuan accounted for 21.9 percent of the country’s total production in 2000. Great strides have been achieved in accelerating the development of Sichuan into a modern hi-tech industrial base by encouraging both domestic and foreign investments in electronics, information technology (such as software), machinery and metallurgy (including automobiles), hydropower, pharmaceutical, and the food and beverage industries. The reserves of hydropower resources in Sichuan measure roughly 150 million kw, which is second only to Tibet, and the exploitable potential is over 100 million kw, more than any other area in China. The auto industry is an especially important sector of the machinery industry in Sichuan. Most of the auto manufacturing companies are located in Chengdu, Mianyang, Nanchong, and Luzhou . Other important industries in Sichuan include aerospace and defense (military) industries. A number of China's rockets (Long March rockets) and satellites has been launched from the Xichang Satellite Launch Center, located in the city of Xichang. Sichuan's beautiful landscapes and rich historical relics have also made the province into a major center for tourism. The Three Gorges Dam, the largest dam ever constructed, is being built on the Yangtze River in nearby Hubei province to control flooding in the Sichuan Basin, in neighboring Yunnan province, and downstream. The plan is hailed by some as a Chinese effort to shift towards alternate energy sources and to further develop its industrial and commercial bases, but others have criticized the project for its potential harmful effects, such as the required massive resettlement of refugees, loss of archaeological sites, and ecological damage. 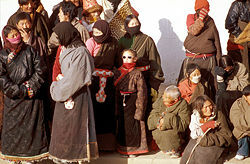 Tibetans as a main ethnic minority group in Sichuan. The majority of the population of Sichuan are Han Chinese, and they are found scattered throughout the province. In addition, significant minorities of Tibetans, Yi, Qiang and Naxi reside in the western parts of the province. 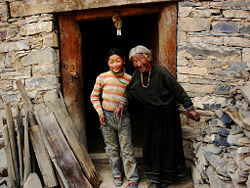 Sichuan has China’s second-largest Tibetan region as well as the largest region inhabited by the Yi ethnic group and the only region where the Qiang people live in their own homogeneous communities. The Yi ethnic group, with the largest population of any minority in Sichuan, lives in the Greater and Lesser Liangshan mountains and the Anning River Valley. The Tibetans live in the Garze and Ngawa Tibetan Autonomous Prefectures and the Muli Tibetan Autonomous County in Liangshan Prefecture. The Qiang people, one of China’s oldest ethnic groups, live mainly in Maoxian, Wenchuan, Heishui, Songpan and Beichuan, at the upper reaches of the Minjiang River. According to statistics gathered in 2000, Sichuan had 42 institutions of higher learning, with a total of 235,470 in-school students and 18,418 teachers. Along with these, the province had 4,866 specialized, regular, and vocational secondary schools, with a total of 4,311,603 in-school students and 243,327 teachers. There were also 43,326 primary schools with a total of 8,026,506 in-school students and 331,551 teachers. Sichuan's education level has steadily improved over the years, which can be observed through the steady decline in the proportion of illiterate and semi-literate individuals within the population. The enrollment rate of school-age children in 2000 was 99.08 percent, which is a respectable figure when compared to other provinces in China. Overall literacy has been increasing year by year in Sichuan, and as the economy continues to develop it is expected that the percentage of the population with at least a secondary education will account for a majority. Life is hard, but we believe everything will be OK. The people who live at Hei Shui, so poor, but they have a faith to make a greater life. God bless them. Li Feng. Sichuan cuisine is one of the "Eight Great Cuisines" in China and is famous throughout the world for its richness and variety. Food in Sichuan is characterized by its spicy and pungent flavor, as well as its use of chili, red hot peppers, and garlic. Some popular dishes in the province include: Hot Pot, Smoked Duck, Kung Pao Chicken, Twice Cooked Pork and Mapo Dofu. Most dialects of Chinese spoken in Sichuan, including the Chengdu dialect of the provincial capital, belong to the southwestern subdivision of the Mandarin group, and are therefore very similar to the dialects of neighboring Yunnan and Guizhou provinces as well as Chongqing Municipality. Typical features shared by many southwestern Mandarin dialects include the merger of the retroflex consonants /tʂ tʂʰ ʂ/ into the alveolar consonants /ts tsʰ s/, the merger of /n/ and /l/, as well as the merger of /ɤŋ iɤŋ/ into /ən in/. The prefectures of Garzê and Aba in western Sichuan are populated predominantly by Tibetans, who speak the Kham and Amdo dialects of Tibetan. The Qiang and other related ethnicities speak the Qiangic languages, which are also considered part of the Tibeto-Burman language group. The Yi of Liangshan prefecture in southern Sichuan speak the Yi language, which is more closely related to Burmese; Yi is written using the Yi script, a syllabary which was standardized in 1974. 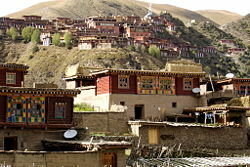 Banba, in Ganzi Tibetan Autonomous Prefecture (甘孜藏族自治州), Sichuan, China. During the Ming Dynasty, major architectural works were created in Sichuan. Bao'en Temple is a well-preserved fifteenth century monastery complex built between 1440 and 1446 during Emperor Yingzong's reign (1427-1464) in the Ming Dynasty (1368-1644). Dabei Hall enshrines a thousand-armed wooden image of Avalokitesvara and Huayan Hall is a repository with a revolving sutra cabinet. The wall paintings, sculptures and other ornamental details are masterpieces of the Ming period. The Li Bai Memorial, located at his birthplace, Zhongba Town of northern Jiangyou County in Sichuan Province, is a museum in memory of Li Bai, a Chinese poet in the Tang Dynasty (618-907). It was prepared in 1962 on the occasion of 1,200th anniversary of his death, completed in 1981 and opened to the public in October 1982. The memorial is built in the style of the classic garden of the Tang Dynasty. This page was last modified on 16 September 2015, at 20:48.